We've never had a dedicated Newbie forum, but it might be nice to have a thread for the new guys to say "Hi" on. Perhaps tell us a bit about you and your car. And don't forget to start your Garage in the link above. You might find it takes a while for some features (images) to become active, but it's worth the wait. Jimmy P, evogeof and NISMO_V-specR33 like this. Mookistar and Ângelo Peixoto like this. Hi , this is my first post, and its taken years to get to posting for me. I have a modified R34 GTR V-Spec UK model which was featured in Japanese Performance magazine and got voted the Nissan of the Year in the awards. It was also the first Skyline in the UK to be fitted with OS 3.2 ltr engine producing 800BHP at the sticky end. I have had this motor 10 years now, thought it was about time I got more social. R35addict, 2j_tyler95 and maildcampbell83 like this. 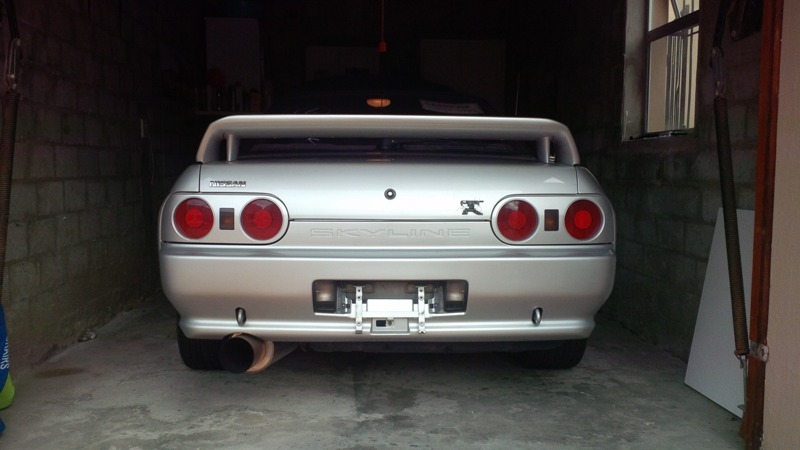 I actually need some help from the UK GTR COMMUNITY because my WHITE R33 N1 GTR which i owned for the past 14 years with Registration M202 EYG was stolen from my garage on Sunday the 20th of April 2014 around 15:15PM by 2 Asians pretending to be genuine buyers during a viewing. 1) Full WHITE TOP SECRET BODYKIT including: Front & rear bumper, side skirts, front engine bonnet, side mirrors, rear boot, 2 black engine bonnet hooks, TOP SECRET black and gold stickers at the side of the 2 front doors. 2) M'S BLACK GT WING, 5 ZIGEN FIREBALL EXHAUST, CARBON LOOK EXHAUST PROTECTOR WITH WHITE CALSONIC STICKER. 3) ALLOY WHEELS: 18 inch BRONZE VALK RACING TE37 with PIRELLI P ZERO ROSSO TIRES ALL AROUND. 4) FRONT BREAKS: 4 POT AP RACING, REAR BREAKS: ORIGINAL BREMBO 2 POT. 6) WINDOWS: Limo black tinted windows all around. 7) INTERIOR: Blue SPARCO STEERING WHEEL( NO AIR BAG), ALPINE TOUCH SCREEN HI FI STEREO, CHROM TOP SECRET GEAR KNOB, WHITE DEFI GAUGES, APEXI AVCR BOOST CONTROLLER, HKS TURBO TIMER. If anybody might have seen the above described R33 GTR N1, please contact me asap. hate to say it Chang, that car is long gone. Welcome to the forum though. Mookistar and oSkylines like this. nice one, start a Garage! Real Name Ant, I live in NE Kent on the Peninsular and work for Delphi in the R+D section in the Gillingham Technical Centre as a Validation Shift Lead/ Supervisor. Having wanted ( needed ? ) an R32 since I was 17, last year I took the plunge and went for it- Yes fuelled by magazine articles and the birth of GT on PS1 lol ! the 21 year itch got me in the end. 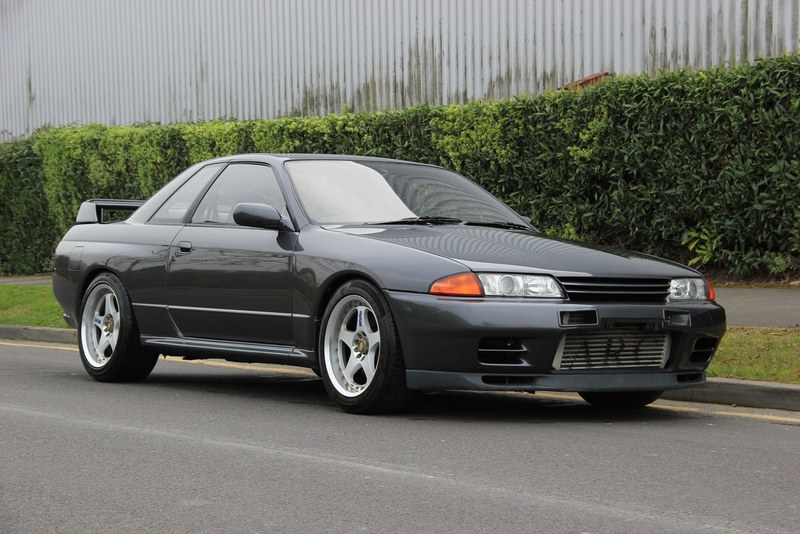 R32 1990 in KH2 with stage 1 mods, purchased late sept last year - almost missed mine as a French guy beat me too it then pulled out whilst HJA were finding a "twin" for me I bought mine as it was exactly the spec colour and rims I would have chose If I were building my own car. It had to be a grey one......... mostly stock and with some provenance. I've done nothing to mine since purchase apart from gutting all the trim out and removing the bodykit and wheels to inspect/clean/ Bilt Hamber the underside and all cavities, bought a power FC for fitting later on, currently got a Mine's VX rom in the ECU. Plans are - polish , polish and more polish and enjoy but currently lurking inside under cover til the weather improves and the grit lorries retire. I've created a garage- excellent feature ! few pics in there for you guys. cheers, i have never been one for these forums, but looking round here, its great. when posting, click the tiny paperclip icon and you'll be able to upload it. But i can not upload it with JPG file?....it is asking for URL?....do i have to upload my picture on the internet somewhere and copy and paste the address and upload it onto the URL? My plan is to get my journeymen in machining by 20-21 years old and then work for an R34 GT-R.
Last edited by RB26DETTpowered; 8th January 2015 at 05:15 AM..
Hi, my name is Shaheem and I've been a registered member since mid 2013. More of a reader than poster, I thought I'd take this opportunity to introduce myself seeing that a dedicated thread has been created (thanks Mookistar). I'm from Cape Town, South Africa, a country where used cars are not allowed to be imported, unless its considered a collectors item. 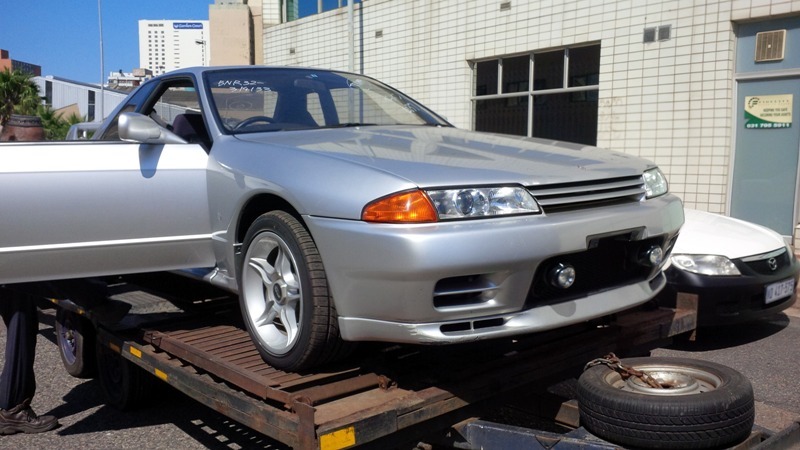 Luckily, the GT-R has made this list a few years ago, so I set out to get myself a nice R32. After a few months of looking, I finally found the car that was within my price range and in decent condition, from the pictures anyway. So three months later it landed on South African soil. The pictures were not a clear indication of the condition of the car as when I saw it for the first time, it was way beyond what I had expected. Not a single dent or rust spot and the interior was absolutely spotless bar the Bride drivers seat which showed some wear. Sadly though 2 days after it landed, I blew the engine as I misread the standard boost gauge. I'm now doing a full forged build with a single turbo conversion. I will start a garage thread soon. 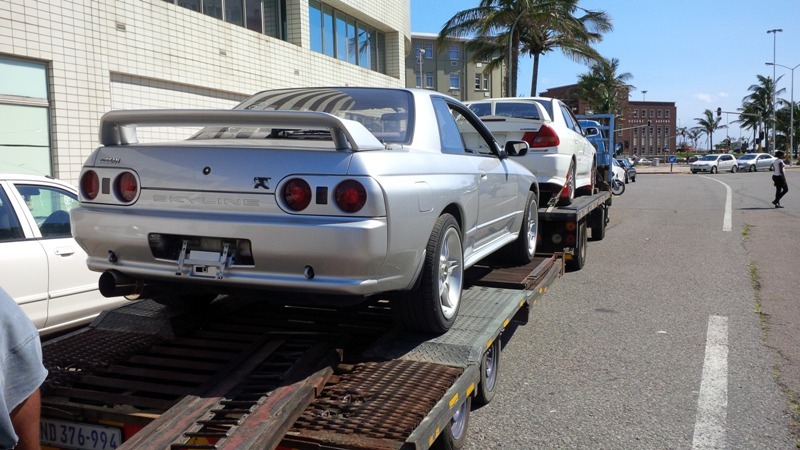 I have attached some pictures of the car when it arrived in Durban, South Africa. Mookistar and zimmersquirt like this.